Great news – Toronto Public Health has announced the lifting of the outbreak at Momiji Seniors Residence. Regular programs and services will resume tomorrow with two exceptions: A.M. Exercise and the January Ice Cream Social are cancelled. As there are still many active outbreaks elsewhere, we ask for everyone to be mindful of hand-washing and to not visit if you are ill.
Momiji Seniors Residence and Toronto Public Health are investigating an outbreak of enteric illness affecting tenants in floors 3-9. Symptoms include any combination of diarrhea, fever or vomiting. Programs and gatherings for tenants are cancelled until further notice. Please assist us in managing this outbreak. Do not visit if you are ill.
Education and leisure courses will run as normal on basement, first and second floors. 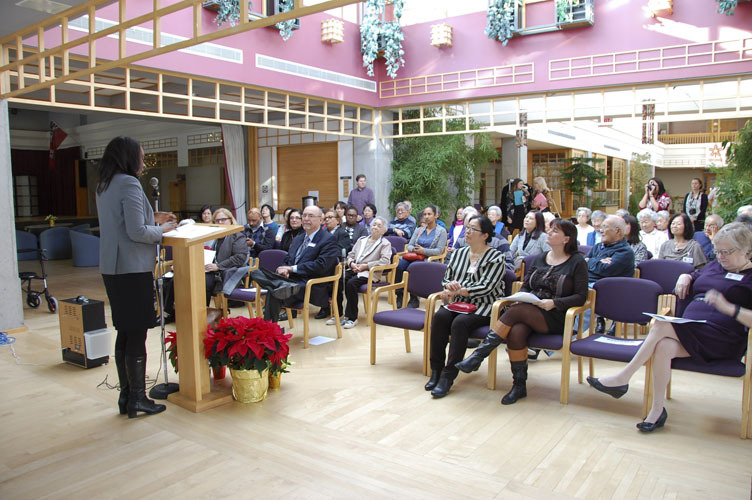 MPP Mitzi Hunter and the Central East Local Health Integration Network (LHIN) made a funding announcement at Momiji Centre, December 12.